Is that “Customer Promise” a “Hypocritical”, or a “Hippocratic”, oath? More than two thousand years ago, the medical profession established a series of moral and ethical tenets to ensure that the practice of medicine was conducted in a way that would always be in the patient’s best interest. Still known as the “Hippocratic Oath” (after one of its possible authors), in its various forms it still provides doctors today with an ethical framework in which to practice their skills, and provides their patients with a source of reassurance. promise” – also intended to reassure their customers of their sincerity, care and professionalism. But how many customer promises are backed up with the equivalent best practice frameworks, comprehensive training, and robust measurement disciplines that maintain the high standards of the medical profession? Or, how many of them merely reflect the aspirations of senior management or the marketing department? Centuries of best practice, science and the development of ethical frameworks are behind the professionalism we have come to expect from medical practitioners. But as customers, how many of us feel the same sense of confidence in the products we buy and the services we receive from other providers such as airlines, car dealerships, real estate agents, banks, power companies, telcos, and insurance companies? Alas, the customer experience research we’ve been conducting for more than ten years in multiple industries shows that it’s common for between thirty and fifty percent of an organisation’s customers to experience problems doing business with them. Imagine the horror if that level of service failure existed in the medical profession. approximately one in four customers who experience a problem. I don’t for a single minute wish to trivialise the importance of the Hippocratic Oath in medicine, but if these same underlying convictions were applied in all customer/supplier relationships, then businesses, government agencies and customers would much more successful. wish it, and as suppliers – we should honour it. Assess your organisation’s current performance by quantifying the problems that customers experience and the impact they have on your business. 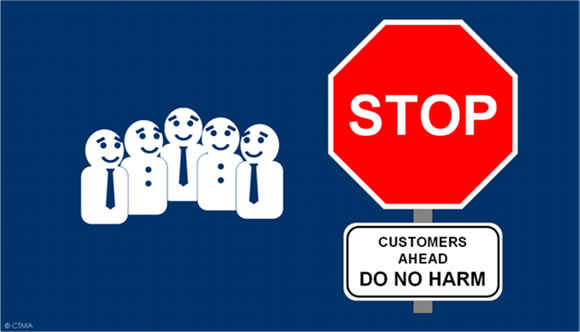 If harm is currently being done to customers, then you must address those problems first - before making more promises that will in turn harm your organisation too. Establish a continuous improvement resource and operational framework for ongoing measurement to systematically identify and prioritise sources of customer dissatisfaction so you can take remedial actions to address them. You will need a robust internal mechanism to ensure you are keeping your promises. Validate your readiness to make your customer promise by checking that everyone in your organisation understands the commitments you are making, and that the whole organisation has the ability to deliver your customer promise. Check that you have all the necessary resources, skills, processes, systems, policies and authorities in place, and that you are really ready to go. If you would like to find out more about how much bad customer experiences may already be costing your organisation, please get in touch and I can send you a complimentary copy of our working paper “Counting the Cost of Bad Customer Experiences”.